Knowing when to charge the battery on your iPod or iPhone is usually pretty simple. Just take a look at the battery percentage on the screen and if it's low, plug the device in. 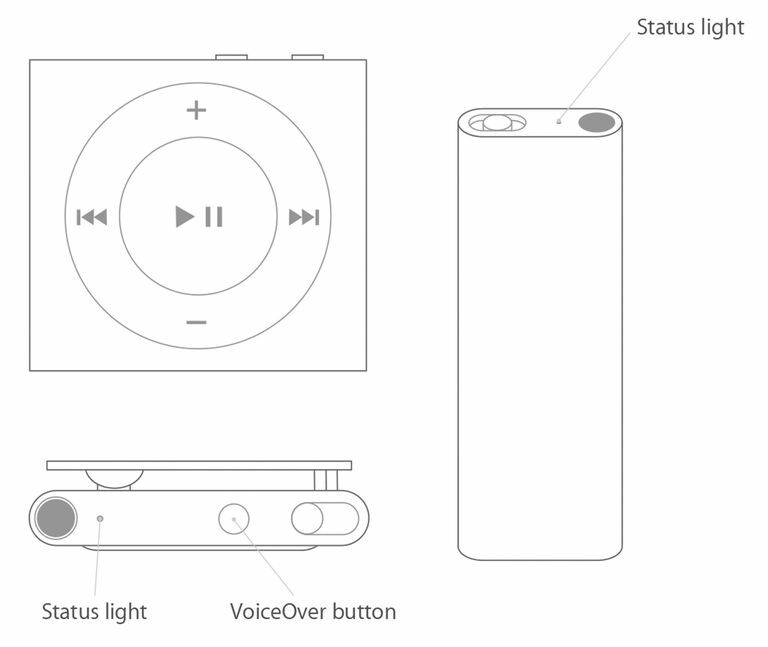 But, the iPod Shuffle doesn't have a screen to show you how much battery is left. So, how do you know when to recharge the iPod Shuffle? The answer depends on the model. Your options include either checking the battery lights or, on models that support it, having the Shuffle speak to you. The 4th generation iPod Shuffle offers two ways to get information about its battery and charging status. It has a battery light to provide information, as well as VoiceOver, which lets the Shuffle speak the battery charge level to you. Blinking Orange: The Shuffle is syncing and should not be disconnected. Solid Green: Between 50% and 100% charged. Solid Orange: Between 25% and 49% charged. Solid Red: Less than 25% charged. If the light doesn't appear, the battery is completely drained. The device won't work until you recharge the Shuffle. Make sure your Shuffle is not connected to a computer. Plug headphones into the Shuffle. Press the VoiceOver button in the top center of the device twice to hear the charge level. Blinking Orange: The iPod is syncing with iTunes or being used in disk mode. Blinking Red: Less than 1% charged. No Light: The Shuffle is off or entirely out of battery and needs to be recharged. You can also use VoiceOver on the 3rd Gen. Shuffle to hear the battery level. Disconnect the Shuffle from USB, put on headphones, and then quickly turn the Shuffle on and off again to hear VoiceOver. VoiceOver also automatically announces when the battery is at 10% charge. Three tones play just before the battery dies. Solid Green: At least 30% charged. Solid Orange: At least 10% charged. Solid Red: Less than 10% charged. No Light: The battery is completely drained. If you see a green light followed by two orange lights, the Shuffle is letting you know that it needs to be restored due to an error with its software. Blinking Orange: The Shuffle is syncing with iTunes. Solid Red: Very low charge.